At Rising Voices, we often publish about media and indigenous groups; perhaps obviously, the audience for these media is very diverse. While for some, digital media is highly integrated into society, for others digital media is far from accessible. We recently published a few articles about indigenous groups, endangered languages, and new media (iPad games, youtube videos, a variety of smartphone apps, etc). In these examples, new media is somewhat extent integrated into everyday life. This article is, alternately, about projects working with indigenous groups that do not – for a variety of reasons – have a high level of access to digital media. Though the Internet can still be of use for their cause, the starting point is quite different. This caricature-like image, from Wikimedia Commons, was originally published in a book called Nordisk Familjebok, 1904 (copyright expired). 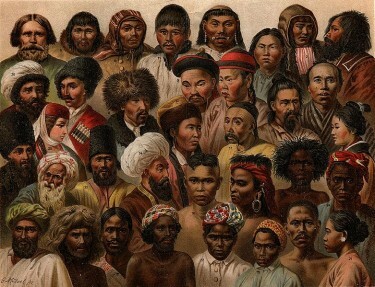 You can find the “key” to where these different “Asiatiska folk” are from by clicking on the image. There are many indigenous communities in South East Asia, where diversity among language and customs is broad. Many of these groups face a variety of difficulties that range from merely inconvenient to potentially devastating. Often living below the poverty line in remote or difficult-to-access areas, indigenous peoples in Asia may be without access to education or health services. An already precarious situation is worsened by, for example, ethnic persecution or land-grabbing from corporations or governments. With some exceptions (such as the persecution of the Myanmar's Rohingya people), these concerns are often unheard, as these problems are structural rather than events-based and thus unappealing to mass media, and compounded by the lack of indigenous journalists to tell their own stories. This is further made worse by local censorship. For example, if a government is making use of indigenous lands (often these are not formally titled, thus creating the possibility for lands to be claimed as unowned or unused) to exploit natural resources, journalists may be unwilling to write about the concerns for fear of reprisal. Nancy Lai, a Malaysian-based journalist, was quoted in the online magazine Bulatlat saying that most journalists practice self-censorship for fear that their newspaper might be otherwise shutdown. This has proven true, such as in the 2012 assassination of Hang Serei Odom, a Cambodian journalist researching illegal logging (illegal logging in Cambodia often takes place on indigenous lands). However, some governments appear to be less concerned about reports going out over the Internet, or perhaps they are merely less able to wield control. Teck Chi Wong, editor of Malaysiakini, an online news media outlet, said that the Internet is relatively free from government regulation (again quoted by Bulatlat). However, some of this may be related to the relationship between local and international control; under certain regimes, some publications can get away with touchy articles, provided they are put out in English (rather than the local language). The Asia Indigenous People’s Pact (AIPP) works to ensure that indigenous people in Asia have access to all forms of media (much of their work focuses on South and South East Asia). Recently, they held an event in Bangkok bringing together pan-Asian journalists and human rights workers for indigenous’ peoples rights, part of a project entitled “Indigenous Voices in Asia” aiming to ensure that indigenous people in Asia have access to all forms of media. 3- unequal access to information. Language barriers and a lack of professional media skills and education among indigenous journalists. Finally, simplification is also as a problem, or, “romanticizing, stereotyping and criminalizing indigenous peoples in mainstream media”. You can follow the “Indigenous Voices in Asia” project on their blog. For a lot of indigenous peoples in the Philippines, they are given access to education not just by local government units but by several NGOs. The latest, somewhat high-profile example is a woman from the Talaandig tribe who was able to participate in the World Youth Day in Rio de Janiero in Brazil. In some areas, their kind of government is followed in the hopes of protecting the environment. They are also engaged in agricultural livelihoods to uplift their economic status.